A modular solution for video walls with up to 20 screens. The heart of the system is the six-slot controller chassis. It uses a high-performance enterprise-grade motherboard that connects to a Radian PCIe backplane. 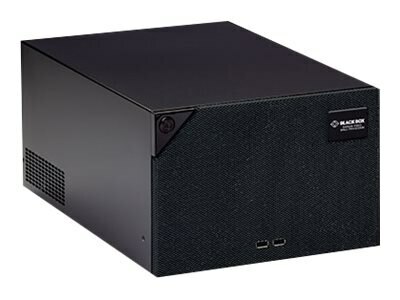 The backplane contains six half-length PCIe slots for use with compatible Radian cards, including video capture, graphics and IP decoding cards. Radian is a hybrid hardware and software solution. It's part of a complete solution that includes the chassis, graphics cards, video capture cards, expansion cards, and software. To help you get the right combination of chassis and cards for your specific application, Black Box offers free application engineering and 24/7 free tech support. Talk to one of the technical experts and Black Box will design a solution for you. And, Black Box will ship the chassis fully loaded with cards and software.